Ford will be a healthy inactive for the season finale Sunday against the Dolphins. Analysis: This comes as a bit of a surprise since Ford has taken 21 carries the last two games and the Bills have wanted to give him as many looks as feasible with an eye toward next season. With Chris Ivory (shoulder) ready to play again, the Bills will go with two veteran backs Sunday, with LeSean McCoy leading the way as the team tries to end its season on a winning note. Ford rushed seven times for 33 yards and added two catches for 14 yards on four targets in Sunday's 24-12 loss to New England. Analysis: Ford got the start at running back with coach Sean McDermott punishing LeSean McCoy for a "situation" between the two, and even though McCoy returned to lead back duties to begin Buffalo's second drive, Ford still ended up outplaying the declining veteran. If injury issues persist in Buffalo's backfield, Ford could once again find himself handling a handful of touches against the Dolphins in Week 17. Ford is listed as the backup to LeSean McCoy in advance of Sunday's matchup against New England. Analysis: Ford made his season debut in Week 15, collecting 14 carries on 41 offensive snaps in a week where much of the backfield was sidelined due to injury. 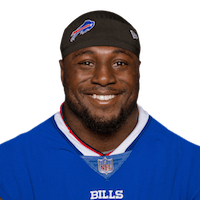 While McCoy is back in the mix and listed as the starter, Ford is the only other healthy true running back on the active roster, as Chris Ivory (shoulder) is inactive and Marcus Murphy (elbow) was placed on IR this week. Coach Sean McDermott said Friday the team will decide in the upcoming day about playing time for LeSean McCoy (hamstring), Chris Ivory (shoulder) and Ford during Sunday's game in New England, Mike Rodak of ESPN.com reports. Analysis: It looks like the two veterans have overcome their injuries and will play against the division rival, but the coaching staff has been saying all along that they would like to keep giving Ford some looks, so expect the rookie to see at least a handful of carries. That said, unless the Bills sit McCoy completely, it's hard to rely on a relative unknown that might be third in the pecking order against a heavily favored Patriots squad. Ford is expected to handle a reduced role Sunday against the Patriots after fellow running backs LeSean McCoy (hamstring) and Chris Ivory (shoulder) turned in full practices Thursday. Ford rushed 14 times for 46 yards and added a seven-yard catch on his lone target in Sunday's 14-13 win over the Lions. Analysis: With Buffalo already missing its top two running backs, Ford took over as the last man standing after Marcus Murphy suffered a dislocated elbow. If none of Murphy, LeSean McCoy (hamstring) and Chris Ivory (shoulder) returns in Week 16, Ford would get the start at running back in New England. Ford, added to the active roster Wednesday, could see action in Sunday's game against Detroit if LeSean McCoy (hamstring) and/or Chris Ivory (shoulder) are unable to suit up. Analysis: If either veteran plays, Ford would likely be relegated to No. 3 duties and would likely see spot action at best. But if both sit, that leaves just Marcus Murphy and Ford to take over the carries. Murphy is higher on the depth chart, but the Buffalo coaching staff has been praising Ford -- an undrafted rookie from Texas A&M -- all week, and they might want to see him get a fair audition with the Bills already eliminated from playoff contention. The Bills promoted Ford from their practice squad Wednesday. Analysis: With LeSean McCoy (hamstring) and Chris Ivory (shoulder) both banged up coming out of the Week 14 loss to the Jets, Ford will join the roster as a depth option out of the backfield. The Texas A&M product has yet to see any NFL action and would likely be limited to a special-teams role if he suits up Sunday against the Lions. There are no videos available for Keith Ford. Click here to view all videos.